Anyone working on large Maven projects knows well about how hard it is to keep in mind all the dependencies between modules and libraries; and even harder, to resolve conflicts between them. We’ve greatly improved Maven Dependencies Diagram to make this whole thing a lot simpler. Maven Dependencies Diagram will be available in the first EAP of IntelliJ IDEA 10. Your suggestions and feature requests are welcome. This entry was posted in New Features and tagged ideaX, Maven, UML. Bookmark the permalink. Does it support Ivy dependencies too? That’s awesome. Can’t wait to see it in action. Amazing. this is really cool. as i see dependencies coloured in a different way. is it because of a different scope? Is it possible to print the dependency diagrams yet? That would help massively when trying to sort out multi-module dependency conflicts. As for a feature request, I’d still love to be able to get a reverse-dependency graph for Maven-imported libraries if that’s possible. i.e. Select a library which has been imported by Maven and then see exactly how that’s pulled in across the project. +1, that’s cool stuff. Would really love to this for Grails dependencies too! Since Grails uses Ivy under the hood, that should not be a big issue. IDEA 8 was excellent, big step over 7. IDEA 9 was even better, big step over 8. With improvements like these, IDEA 10 looks to be amazing. 2Alexander: yes, it is so. Project modules are colored in blue, test scope in green (as usual). Also, there are few features I forgot to mention about. In Eclipse plugin screenshot, in case of conflicts (same dependency from multiple sources), in a single glance I can see the final version of the dependency that will be used. Is there anyway we can achieve that here also? Very nice. Any chance that this will also support Ivy? If not, it would be helpful if the feature were implemented in such a way as to make it (relatively) easy to come up with a plugin for Ivy support. There’s only one word for that: awesome! This is great, but we use (Ant+)Ivy. Any chance of Ivy support for this? Any chance of 1st-class Ivy support in IDEA (rather than a 3rd party plugin)? Also, it’s possible to save diagram to gif, png, jpg to use in documentation. Ivy is not IntelliJ IDEA’s bundled plugin. But if we decide to bundle it or write our own support for Ivy, diagrams will be there with no doubt. 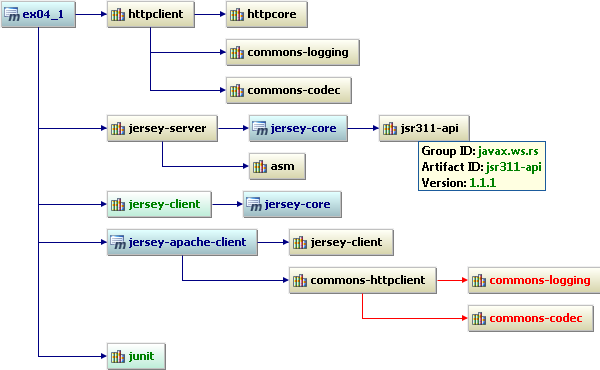 Anyway, authors of Ivy plugin can contact me and I can tell them about UML-API in intelliJ IDEA to create such diagrams in one day. Konstantin Bulenkov, I’ll be interested in knowing more about the UMP-API to create such a diagram for Ivy. @Jens Nerup: I’ve sent you details about UML-API by e-mail. Ivy support is planned for IDEA 10. However it is not yet clear if the first version of the support will include diagrams. The priority is automatic management of libraries provided through ivy and support for resolving artifacts. Will it be available in IDEA Community Edition? @Oleh Unfortunately it won’t. We can’t use the diagramming library in free version of IntelliJ. Would this work with parent-pom’s too though? For example, if the parent pom defines the versions of dependencies using dependencyManagement, and my project’s pom only refers to the groupId and artifactId without the version, would it still produce the maven diagram? Could you please include ivy support of any kind in IDEA 10. Currently it block us from moving from IDEA 9. Unfortunately we don’t plan to include an official Ivy plugin in IntelliJ IDEA 10 (which has already been released, and thus feature-complete). You can contact the developers of existing third-party Ivy plugins and ask them to update the plugins for IDEA 10 compatibility. I have a IntelliJIDEA 10 Ultimate trial version. How do I bring up the dependency editor? The dependency editor? To edit pom files? You can navigate from node to corresponding place in pom file by pressing F4 on a diagram. Works great! But how to zoom the diagram? 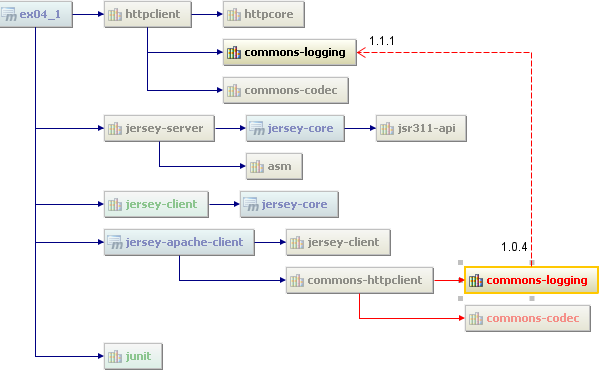 My Maven project generates a huge diagram. To fit in the window, the diagram is scaled down, but now the text is so small I cannot read the version numbers. How the enlarge? Any way I can find the usage of a given maven module in my project by other modules in that same project ? I tried find usage on the pom.xml but it does not find other pom.xml referencing it. me too, how can i resolve it?